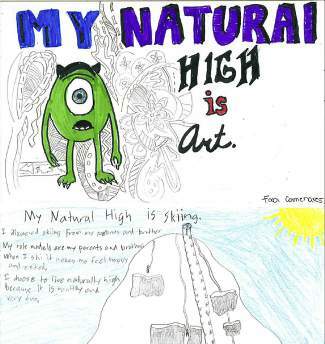 ACMS students created "Natural High" postcards as part of their pledge to stay drug free. TRUCKEE, Calif. — Did you know: Children of parents who talk to their teens regularly about drugs are 42 percent less likely to use drugs than those who do not; yet, only a quarter of teens report having these conversations? During the week of Oct. 26-30, Alder Creek Middle School’s commitment to a drug-free lifestyle and healthy lifestyle was on full display, as students and staff participated in the nationally celebrated Red Ribbon Week. 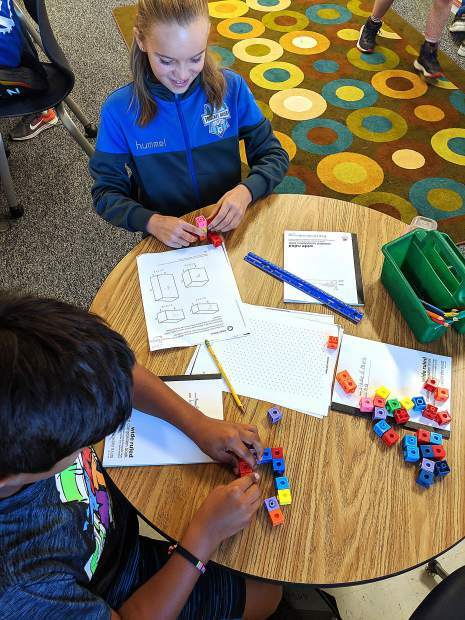 “Red Ribbon Week is an ideal way for ACMS students and Truckee to unite and take a visible stand against drugs and substance abuse,” said Rose Weskamp, ACMS PTO Co-President and parent. The highlight of this year’s campaign was, “Respect Yourself. Be Drug Free,” and students were engaged in fun activities all week … such as “Dance Away Drugs, Dance Challenge” and music at lunch every day, among others. As students participated, they were entered into a raffle for prizes such as Full Belly Deli gift cards. Leadership students, peer helpers, safe school ambassadors, and Club Live students created and facilitated all of the lunchtime activities, promoted Red Ribbon Week and decorated the school. On Oct. 27, students were invited to participate in a group picture demonstrating their spirit for pledging to be drug and alcohol free. TTUSD Superintendent Rob Leri attended school that day and joined in the photo. Students also participated in the Natural High campaign in their Advisory classes. Natural High is a nonprofit organization that seeks to encourage students to discover and pursue their natural highs or their passions as a reason to say no to an artificial high. Students watched inspiring celebrity videos highlighting their journeys, goals, and natural highs that empowered them to achieve their dreams. Students were then challenged to create a Natural High postcard that featured and described their own Natural High. Mrs. Ferlin’s QUEST class is creating a wall of Natural High pledges, featuring each student’s postcard. “The highlight of Red Ribbon Week, for me, was Disco Dance Day because I won a Full Belly Deli gift card for dressing up,” said student Evan Anderson. The unification against drugs and substance abuse effort during Red Ribbon Week at ACMS included parents. Also on Oct. 27, TT-FWDD’s Program Coordinator Devin Bradley and Weskamp invited parents to sign a Committed pledge — “Parent & Adults Committed To Stopping Underage Drinking and Drug Use” — before school, while serving coffee and muffins as parents dropped off their students. According to ACMS, the pledge is designed to provide positive support to parents and families in Tahoe-Truckee to reduce underage drinking and drug use, and youth access to alcohol and drugs by increasing support to parents and families with teens. Visit ttfwdd.com/committted.php to learn more. Rachel Koles is school counselor at Alder Creek Middle School.